Dhaka, Bangladesh (BBN)- Bangladesh Bank (BB) Governor Dr Atiur Rahman has asked all banks to ensure defense system against banking malpractices. “A good corporate governance system needs to be in place to reward the worthy and punish the habitual offender. This is the first line of defense against banking malpractices and derelictions of duty,” the central bank chief said while speaking at the Nurul Matin Memorial Lecture on ‘Ethics in Banking’ in the capital Dhaka on Friday. 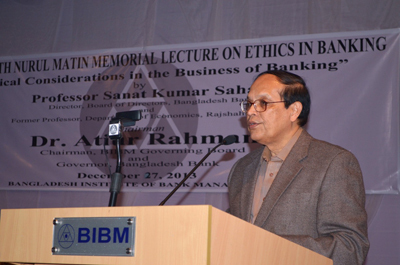 The Nurul Matin Memorial Lecture series, organized annually by the Bangladesh Institute of Bank Management (BIBM), attempts to bring out the basic issues of ethical behavior or the lack of it in a public forum to encourage, underscore and disseminate the issues among the banking professionals so that the edifice of mutual trust and confidence on which banking business rests does not crumble which can have serious repercussions throughout the economy. Speaking on the occasion, Dr Rahman said at workplaces, corporate culture plays an important part in indoctrinating an employee to a particular line of thought while a culture of impunity and the absence of the rule of law encourage imprudence and recklessness. Besides, he said, a work culture that promotes and sustains honesty and probity, reinforced by appropriate incentives and punishment, is conducive to the growth of an ethical organization. “Thus, supervisors need to establish a system of transparency and accountability and should themselves follow that system strictly so that subordinates may emulate that attitude and norm,” the governor said. This year, the 13th Nurul Matin Memorial Lecture delivered by Professor Sanat Kumar Saha, a senior member of the BB Board of Directors and an eminent development economist of the country. He speaks on the theme of the “Banking System and Ethical Considerations”.